One of the major contributions of Luis De Garrido to architecture has been the establishment of an advanced design methodology that allows achieving an advanced architecture capable of thermally self-regulating, and naturally lit, to ensure the welfare of its occupants without technological devices. Thus the buildings projected by Luis have the least energy consumption possible, and hence a very low economic cost, both in its construction and in its use. 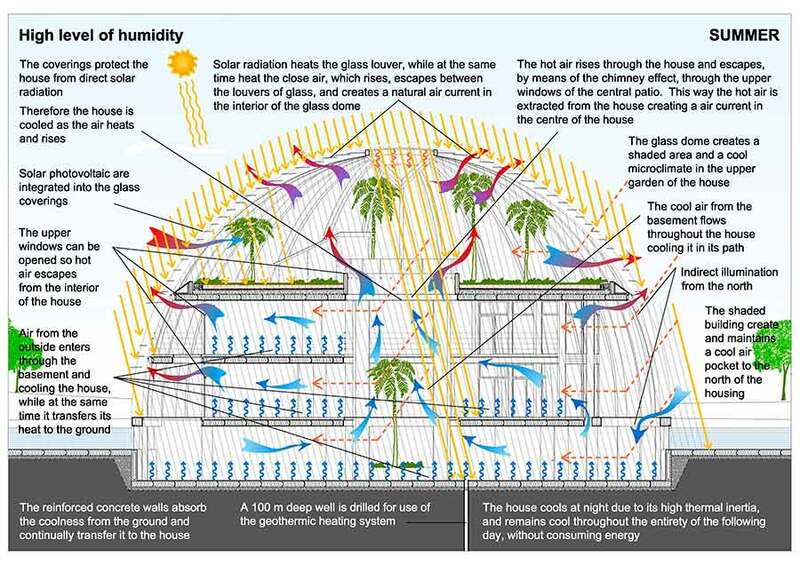 Later, at the stage of debugging of the idea and engagement of different architectural elements, Luis De Garrido uses up to 50 bioclimatic architectural strategies, identified by himself, in order that his buildings can be heated or cooled by themselves, without technological devices. These bioclimatic architectural strategies are nothing more than clusters of certain common architectural elements (walls, windows, glass, overhangs, holes, double walls, floors, tunnels, etc.) that form partial architectural structures capable to keep the building warm or cold. As a result, Luis De Garrido is able to design buildings able to be heated or cooled by themselves to ensure the welfare of its occupants, just because of its special design and without using technological devices.